Mind Your Body Pilates - also known as M.Y.B. - adds Active Isolated Stretching - also known as A.I.S.- to the carefully-considered fitness-with-integrity techniques the studio offers to well-balance and well-inform its clients in addition to an already large and varied selection of group classes on Pilates Reformer, Tower and Chair. Active Isolated Stretching is a technique that helps to maximize the effectiveness of stretching without causing discomfort. Starting in early September, clients of Mind Your Body Pilates UES will be introduced to a new class that incorporates Active Isolated Stretching - or A.I.S. Thirty minutes of this unique stretch technique will focus on releasing tightness in the lower body to prepare the legs, hips and lower spine to more efficiently progress into a shortened version a traditional Pilates Mat series of exercises. One of the most common problems with the body is excess tension. 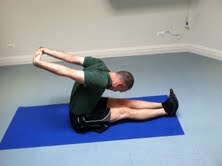 Proper stretching before a workout improves performance by increasing flexibility, which grants better range of motion. Typical "stretching" - even just in the way people think of "stretch" - pushing and pulling on a whole group of muscles without much thought or focus - holding until it aches - this kind of stretching can actually be injurious, and very often causes pain rather than releasing the overwork and strain of the underlying muscle-imbalances. In Active Isolation Stretching, the participant preps to stretch an isolated muscle by simultaneously contracting and relaxing specific target points. A.I.S. utilizes gentle, quick and repetitive stretch motions rather than holding to maximize the effectiveness of stretching without causing discomfort. The new Mind Your Body Fitness class will incorporate A.I.S. 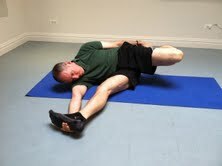 to stretch and release the lower body - including hip flexors, hamstrings, quads, lower back, and IT band. Gail Giovanniello, owner of Mind Your Body Pilates gives careful consideration to any additional fitness techniques chosen specifically for the Mind Your Body clientele to complement the main staple of the studio which are the Pilates classes. She doesn't hop on a fad or trend to sell more class packages, but rather integrates into the MYB schedule classes which will add depth to the understanding of the body which is approached mainly through the studio's generous offering of and devotion to Pilates. Each class with five or fewer students and available seven days a week. Complimentary press previews with Gail Giovanniello can also be scheduled for alternate times.